Today’s blogpost is Part II in our 3-part series on retail counter displays. Our primary objective is to share examples of different types of counter displays that can drive sales on the countertop. As we mentioned at the start of this series, retail counter space is perhaps the most valuable real estate in most stores because it tends to be limited in terms of availability while also being among the most trafficked areas of a store (particularly by the cash register). In Part I of our series, we focused primarily on wood counter displays. If you missed it, you can check it out here. Today, we’ll concentrate on metal counter displays. Let’s get started. 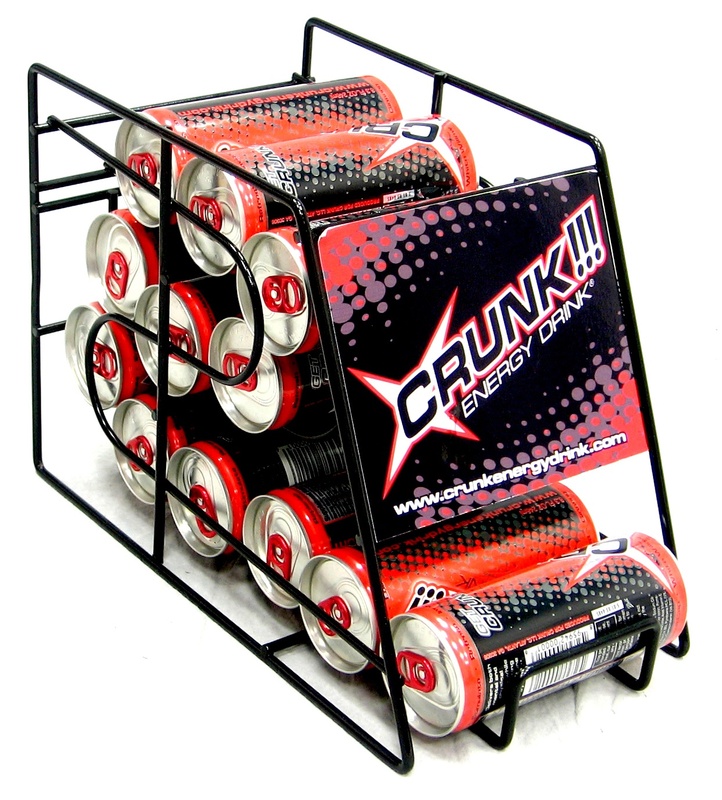 The Crunk display shown below is a very and cost-effective gravity-fed wire merchandiser for cans. This one is for energy drinks, but the same design would work of any kind of canned item. The display’s serpentine design creates visual interest while also providing the functionality for the gravity-fed component of the display. The front sheet metal logo plate keeps the Crunk brand front and center. If your product is valuable or even if you want to create greater perceived product value, you might want to consider a retail counter display that locks. There are many variants of locking case displays on the market. 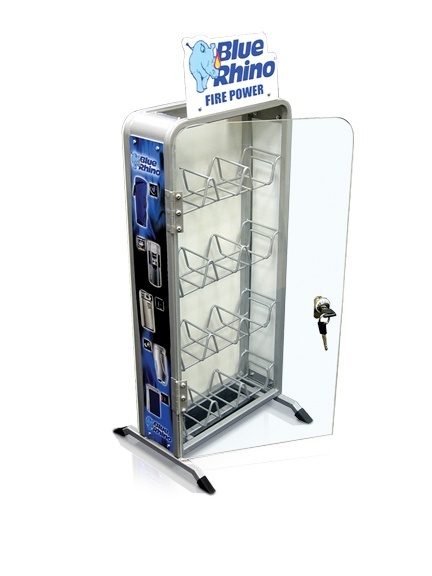 The Blue Rhino display shown below is for licensed Blue Rhino lighters. 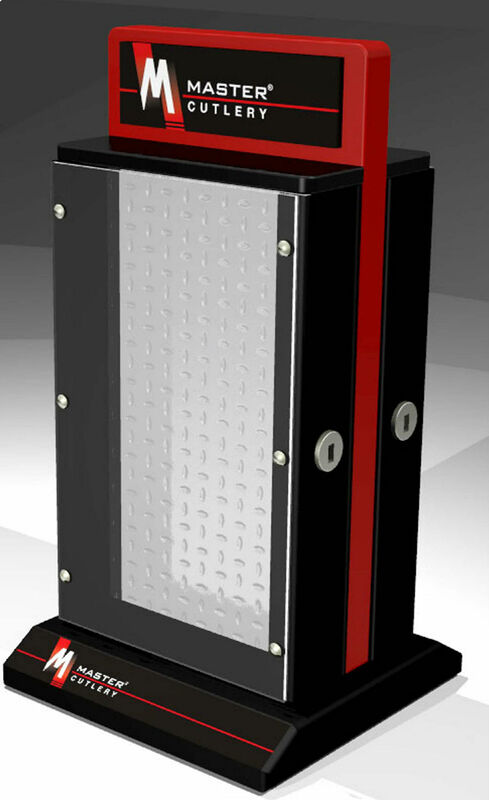 Since these lighters are small and relatively high value, our customer wanted to minimize theft so we designed the cost-effective locking case shown below. We were able to value engineer this display and get the price down by using a simple metal tube structure with wire shelves. We used digitally printed PVC graphics for the sides and header along with a plain white PVC back panel. We added a clear acrylic locking front door and a clear acrylic window on top of the display to let light in. 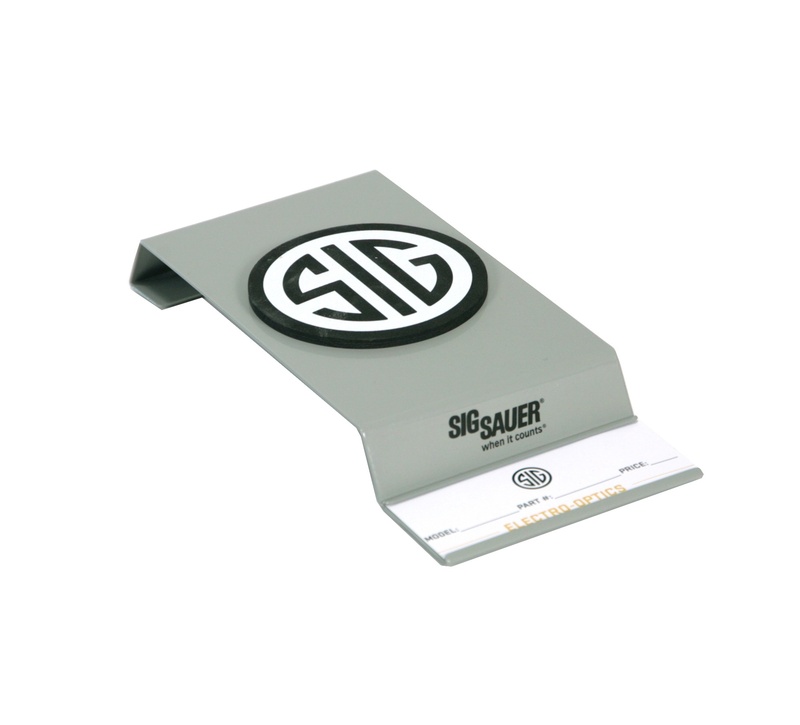 Our next four examples are part of a family of sheet metal counter glorifiers designed to showcase Sig Sauer’s line of firearms. Each of the four displays is designed for a different product, but they all share a number of common characteristics, including: (1) powder coated sheet metal construction, (2) screen printed graphics, and (3) removable product information cards. Some of them also have a branded PVC foam pads and a folding rear easel feature to allow the display to stand on a countertop or on a shelf as well as hang on slatwall. The first one below also has rubber sleeves on the cradle to protect the guns from scratching. One way to maximize counter space is to create a spinning display. 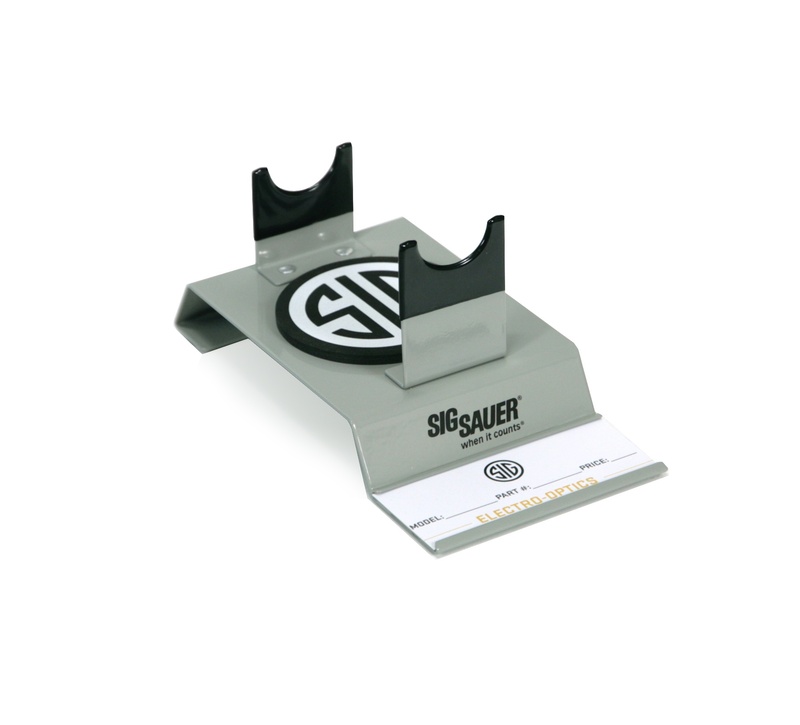 Countertop spinners are a great way to show multiple SKUs while also engaging shoppers by having them spin the display. There are lots of countertop spinners out there in many different formats. 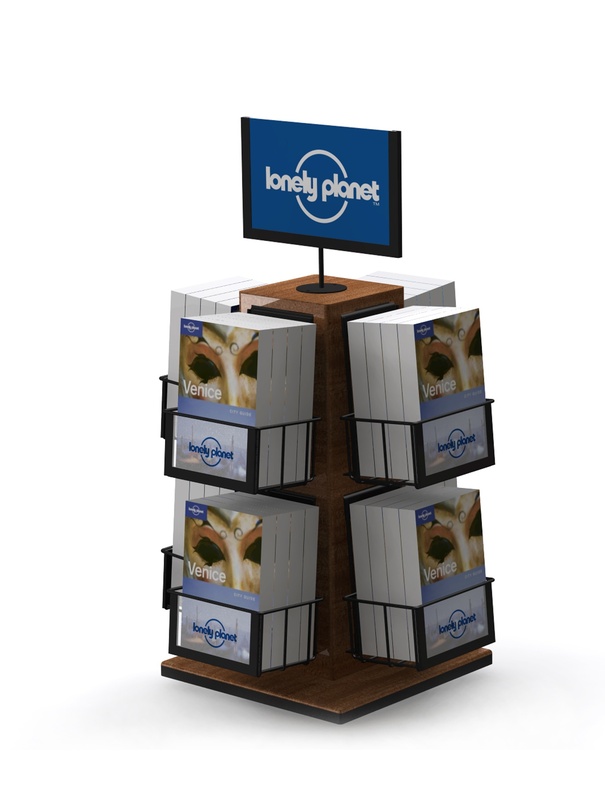 We wanted to show the Lonely Planet book spinner below as an example of how you can combine cost-effective wire pockets with a wood base and center post to dress up the display a bit. 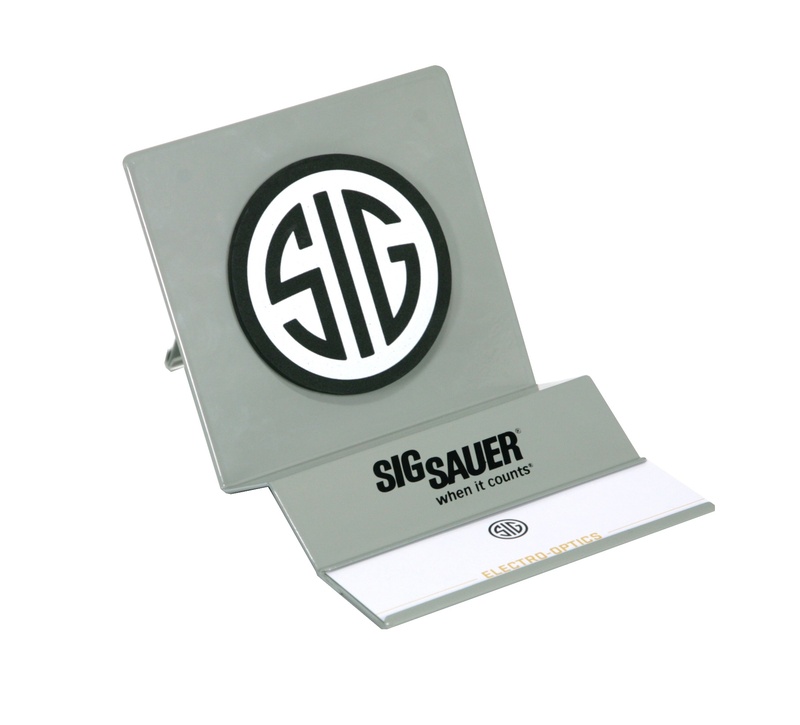 This display also features strong branding with logo pocket branding on 4 sides and an interchangeable header sign. The main disadvantage of a spinning retail counter display is that the shopper can’t see all of your product in one view. 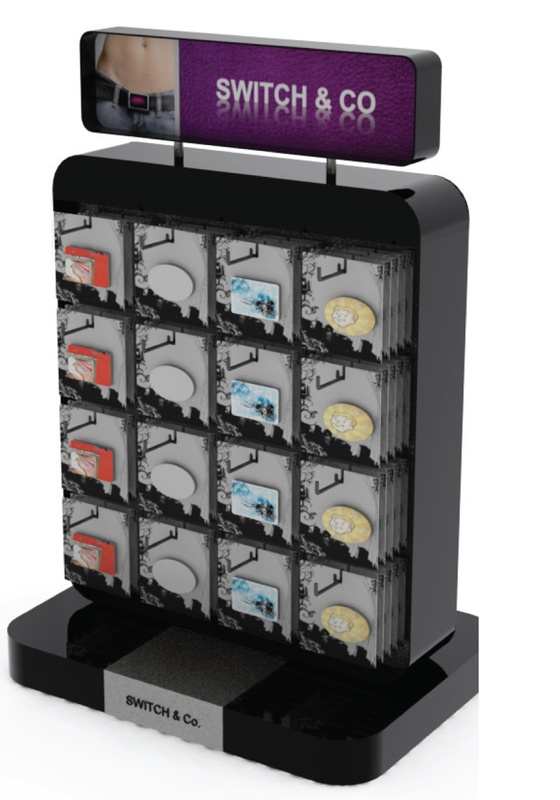 If this is a concern for you or if you have a product that is small enough to merchandise on a single panel, you might want to consider a 1-sided counter display similar to the Switch & Co. counter display we designed below. 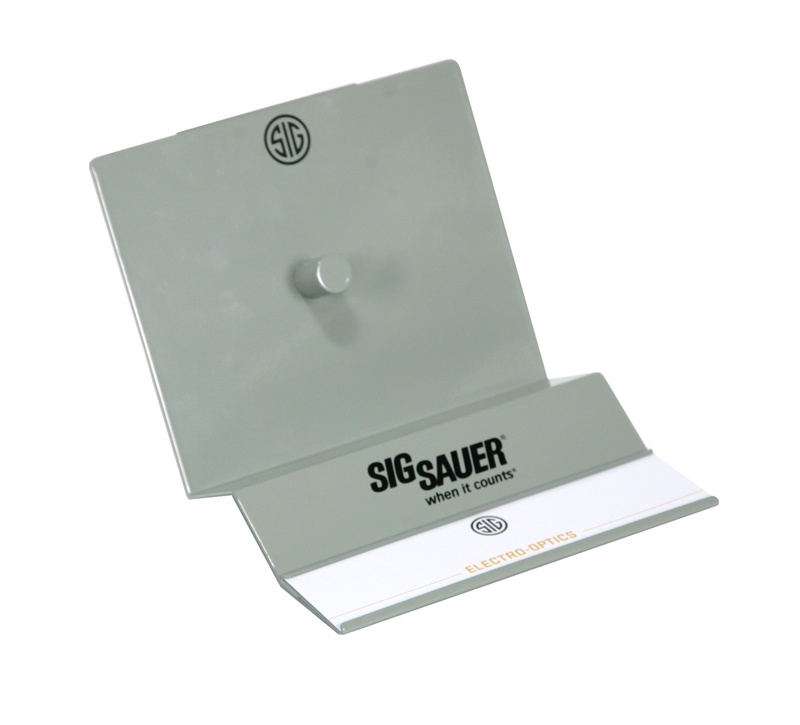 This display features all-metal construction with powder coated sheet metal for the base, back panel, main structure, and header sign holder. Our customer’s product could be merchandised on hooks, but this same structure could be designed with shelves for other types of products. We added a branding plate on the base and a direct printed acrylic graphic in the header sign holder to create more of an upscale image. Next, we wanted to show an example of a 2-sided countertop display. The image shown below is a double locking case we designed for Master Cutlery. Like the Blue Rhino lighters discussed above, our customer’s product is expensive and relatively easy to steal. When it comes to knives, there is also a safety issue so it makes sense to lock the product up. We designed the display shown below with sheet metal construction and locking clear acrylic doors on 2 sides. We used an embossed diamond plated back panel inside the case, an angled front base with graphics, and a framed header sign with a double-sided graphic. 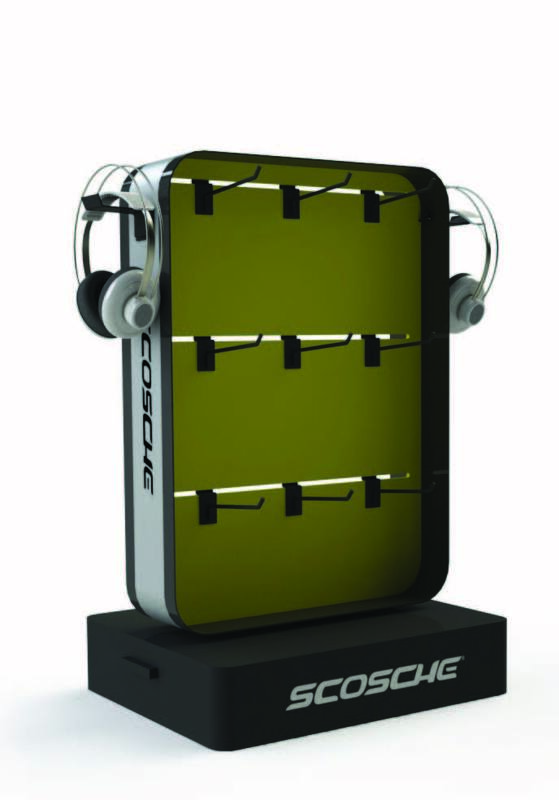 The Scosche headphone display shown below is another example of a 1-sided display constructed of sheet metal. It has a slotted back panel for adjustable hooks, screen-printed side graphics, side-mounted brackets for hanging unboxed head phones, and a raised branded base. 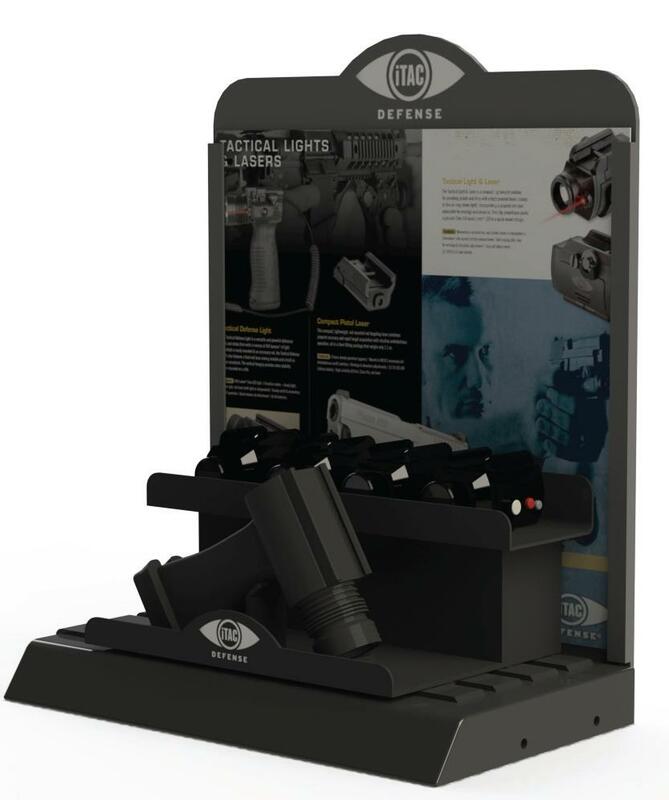 Our final example today is a countertop display we designed for a line of tactical lights and lasers. Featuring black powder coated sheet metal construction, we designed this display to match the rugged aesthetic of the tactical equipment market. We created a branded front glorifier and a rear product riser, both of which were attached to the main display platform. Since the product required a highly educational sale, we created interchangeable back panel graphics to explain the product line. Be sure to check out Part III of this blog series in which we will provide examples of acrylic counter displays.